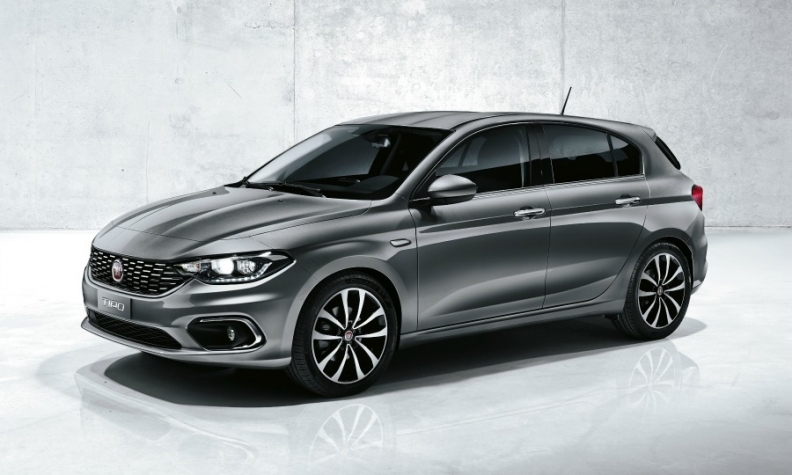 Fiat unveiled the Tipo, shown, in Geneva. The five-door replaces the Bravo in Europe. MILAN (Bloomberg) -- Fiat Chrysler Automobiles is embarking on its biggest expansion in Europe in at least a decade, as the automaker faces crunch time over a strategy to more than double profit by 2018. After delaying investment in the region for years, CEO Sergio Marchionne is going all-in at the Geneva auto show this week with 10 new or refreshed models, ranging from the affordable Fiat Tipo to the upscale Maserati Levante SUV. Alfa Romeo is a particular focus with entry-level and performance variants of the new Giulia sedan, as well as refreshed styling and upgraded features on the Giulietta hatchback. "With the new models coming to market -- including the Tipo hatchback and full lineup of the Alfa Giulia -- we expect to consolidate the improving trend we are encountering in Europe," Alfredo Altavilla, who runs Fiat's operations in the region, said in an interview Tuesday at the show. While the about-face in Europe is partially a sign of the market's recovery, Marchionne also has few other options. Fiat's once-lucrative business in Latin America is struggling because of a slump in Brazil, while prospects in China and the U.S. are uncertain. That makes Europe particularly critical for the executive, who has a lot riding on his 2018 strategy including personal holdings of about $94 million in Fiat stock. "Fiat is showing the results of its strategy aimed at selling higher-margin cars in the European market," said Ian Fletcher, an analyst with IHS Automotive in London. "There is clearly a comeback in Europe as the region is surprising several automakers for still being a very valuable market." Marchionne will need the new cars -- which also include the Fiat 124 Spider roadster, built in Japan in partnership with Mazda Motor Corp. -- to be immediate sales successes to overcome skepticism about his targets. The 2018 goals also include eliminating 5 billion euros in net industrial debt and generating a cash surplus of 4 billion euros. Amid the doubts, Fiat shares have tumbled 24 percent this year, making it the worst performing major automaker. The new push in Europe may be helped by fortunate timing. In addition to rebounding overall demand, Volkswagen Group, Europe's largest automaker, is sidetracked by its efforts to find a way out of the emissions-cheating scandal. The combination could help Fiat gain market share. Its European sales are projected to climb by 7.7 percent to 1.26 million cars in 2016, outpacing an industrywide 1.8 percent gain, IHS Automotive estimates. "Helped by the introduction of new models, we expect Fiat to outperform in the European market this year," said Massimo Vecchio, an analyst at Mediobanca in Milan. Vechio sees Fiat sales increasing about 8 percent in the region in 2016 -- double his forecast for the overall market increase. Fiat's Geneva push is the result of a dual-strategy for Europe: upscale cars built in its home country to leverage the "Made-in-Italy" allure for the Maserati and Alfa Romeo marques and no-frills vehicles for the namesake brand made in places with lower labor costs. The carmaker said it already has 20,000 orders for the Tipo sedan, which has a base price in Italy of 12,500 euros ($13,600). All the Tipo models are produced at the Bursa plant in Turkey as part of a joint venture with Tofas. Marchionne in January tweaked his 2018 strategy to adapt to new market conditions, including slower growth in China. In doing so, the CEO postponed the introduction of bigger Alfa Romeo models -- primarily for China -- in favor of updated versions of the nameplate's top selling MiTo and Giulietta hatchbacks for Europe. "With the auto industry facing major technological changes in the next decade -- with possibly new players coming from outside the auto-industry -- Fiat is tactically focusing on segments and markets where it sees faster and more certain returns," said Giuliano Noci, a marketing professor at Milan Polytechnic. "Before pushing for massive investments destined for an uncertain Chinese market, it makes sense to widen offerings in a market you know so well as Europe."